The packaging of the light was nice. A good move on OxyLED’s part, because they’re up against some heavy hitters in this category. If you’re looking for name brand bike lights in the 1500 lumen range, you’re going to be looking at Serfas, Light & Motion and Gloworm (although the Light & Motion got pretty bad reviews) and they will all be $350+. It’s important for OxyLED to pay attention to these finer details when their target audience for this light will be riders expecting quality products. My only complaint here was that the instructions were printed on a single side of the page. We’re bikers. We care about the planet (for the most part)! That and the instructions had no indication on how to turn the strobe on. Or where the power button was. Or where the mode button was. Or any pictures that would show how to use the light, for that matter. If you’re going to leave some blank paper, you may as well fill it up and make use of it, so the user doesn’t have to guess. Speaking of how the light functions, it wasn’t hard to figure out. There are only two buttons and within 15 seconds, I figured out that the button on the left was the Power button, the button on the right is the Mode button and that long pressing the Mode button gives you the strobe option. Make sure to plug the battery pack in before you use the light. Like most electronics with a battery, the batteries do best when they start out with a full charge. I left the battery pack plugged in overnight to prep for testing the next day. The wall adapter conveniently tells you (with a green or red LED) when the battery is charging (red) or when it is complete (green). Once the battery pack was charged, I had to play around with it a bit to see how dang bright this thing is. Whoa! 1500 lumens is a lot of light! I was getting antsy to get out on my bike at night after seeing how it lit up my garage. The light provided a nice, clean white light when turned on. Then, I realized that I had two other modes to cycle through. I had been on the lower mode. The BL15 kicks out some crazy light. I tested the strobe next and nearly got sick. It is very strong and quick. When the light is this bright and the strobe is that fast, it made my head spin a bit, so I quickly set it back to full-on. I didn’t notice the light getting over heated while I was testing it. There is a safety check on the light that will automatically dim when the light is overheating. I’ll take note of this to see how often this happens (or if at all). The BL15 comes in a variety of colors to match your bike. You can check them out on Amazon in Black, Yellow and Blue. You may be asking yourself the same question at this point: how long is this light going to last? It only costs $40, which means that you can buy it on Amazon and get it shipped for free to your house. This will save you about $310 over buying a brand name light that kicks out the same amount of light. I intend to answer this question for you and will report back in the next couple of weeks. Check back then for my update. So, I’ve been using this light for the past couple of weeks. I’ve got to say that I am very pleased with this light! This light is bright; super bright. This light will set you back $40. This light isn’t that heavy (25 ounces). Yes, it is measured in ounces; not grams. This light is awesome, though. Let’s dig in. The price of this is $40. Yes, I said it again. $40 for 1500 lumens of “I’m going to light up everything in the path goodness”. And it really lights everything up. I most likely would have ridden right past this (link is slightly gory) had it not been for the OxyLED BL15. Check other lights out at your local bike shop or major retailer. See what you’re going to pay for 1500 lumens. My next concern, of course, is the expected life of this light. So, I asked OxyLED. They kindly responded to my question stating that this light will last “over 3 years”. Keep in mind that this is an unofficial statement from a company representative. It was also pointed out in this email that you will get this expected life if you make sure to protect the electrical components of the light system (don’t leave the battery with a low charge for a long time and don’t overheat the light). At $40, anyone has the correct concern that they’re buying a low quality product. I did not get the impression that this was a low quality light. Are there things that I would change on it? Sure. I’m a picky engineer and can usually find something that should be improved on a product. Nothing is perfect. Now you’ve heard the pros about this light. What is wrong with it (or could at least be improve)? Most importantly: there is no side illumination on this light. None. See the image below. The only light that you can see coming from the BL15 is headed straight forward. The design of this would clearly accommodate some side illumination. This is a machined aluminum housing (very nice, I might add) with two CREE LED’s. A simple change to the housing design to move the side wall back, change the LED casing to remove some of the side wall and angle both of the CREE LED’s out by about 5 degrees. All of a sudden, you have some side illumination and a net loss of forward light at pretty much zero. This would improve safety dramatically. The second thing that I did not like about this light were the mounts. Were they difficult? Not at all. They were surprisingly simple and this was great. But during my testing, I went down some stairs (on purpose) on my road bike and off of a curb (again, on purpose). In both cases, the light moved to a less than optimal (sometimes very much so) position. I had to reposition the light so that it illuminated the path in front of me again. I immediately thought of the promotional picture in OxyLED’s instructional pamphlet of this light mounted on a mountain bike. Yeah, right! is what I thought. I would have rattled this light upside down on my handlebars on a mountain bike. The battery mount was a bit better. It was basically a 2″ wide Velcro strap that held the battery onto your frame. Simple and effective. It didn’t move at all and the Velcro strap held the excess wiring. Battery pack mounted on frame. In regards to the battery, I have not had the battery fail on me or die yet. I’ve used it about 5 hours on high and am still going. This seems like a pretty good deal to me. 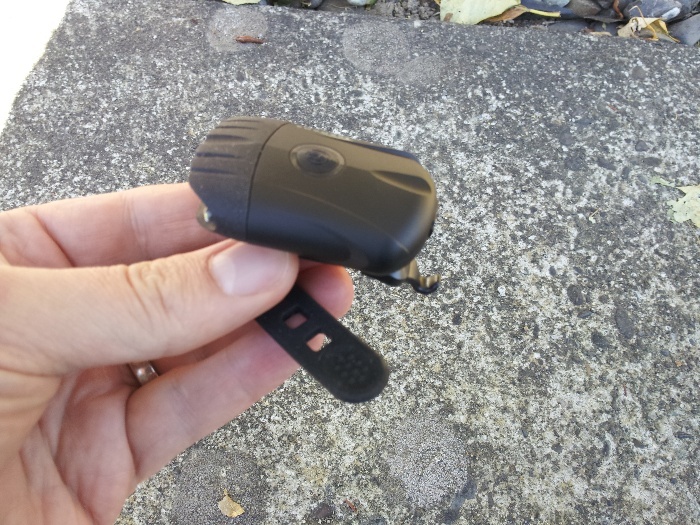 Especially when you can remove the battery pack easily from your bike, plug it in overnight and be ready to ride the next day with a full charge. At the end of the day, I’m really happy with this light. The weight is probably the biggest detractor for this light. 700 ounces is a lot for any cyclist paying attention to the weight on their bike. For those that don’t (like me), it doesn’t matter. You’re not going to notice the extra pound compared to the $400 model lights. You’re going to enjoy the extra 0.75 pounds of dollar bills still in your wallet (I did the math). If you’re looking for a very bright light for little cost that will last you a few years, I would highly recommend this light. If you’re interested in other light products, Hisgadget (maker of the OxyLED BL15) is having a holiday sale. You can find their deals here. I’ve been looking for a headlight for my bike that’s a bit brighter and when Dorcy contacted me about their 220 lumen headlight, I was all too willing to check it out. 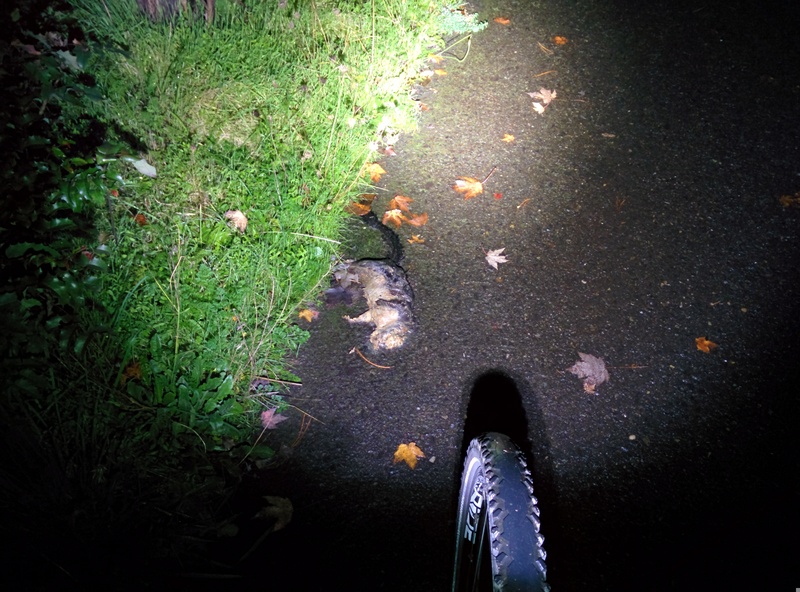 The mornings are still pretty dark when I get up to ride and my current Serfas USL-5 only puts out about 70 lumens. This sufficed when I commuted on roads with very little traffic, but now that I live in a more populated area, I want something that illuminates the road/path/etc in front of me more so that I can see and be seen better. Dorcy 41-4001 in package (aka ‘It’s Little House’). When I opened up the box from Dorcy International, I was pleasantly surprised to see that the light came with it’s own set of batteries. I’ve always thought that it’s cheap of companies to sell a product that uses batteries and not supply you with a set of batteries that is probably only going to cost them a couple of bucks (or less). Moving along, though. The packaging is nice. Definitely something that you would expect to see sitting next to other bicycle headlights. I say this because Dorcy specializes in flashlights and hand held torches. Once past the cardboard and PET packaging (not much of a struggle), I was met with the final product. My first reaction was to how heavy the unit felt in my hands. It’s solid. A nice feeling if you don’t mind the added weight on your ride. The whole unit (with clamp) is 185 grams. Quite a bit more than the 37 grams that makes up the Serfas light I’m using. The housing of the Dorcy light is machined aluminum and the do a good job of it. It’s got a nice design and when removed from the handlebar clamp, it actually feels pretty good in your hands. This is, of course, the second intent of this light. 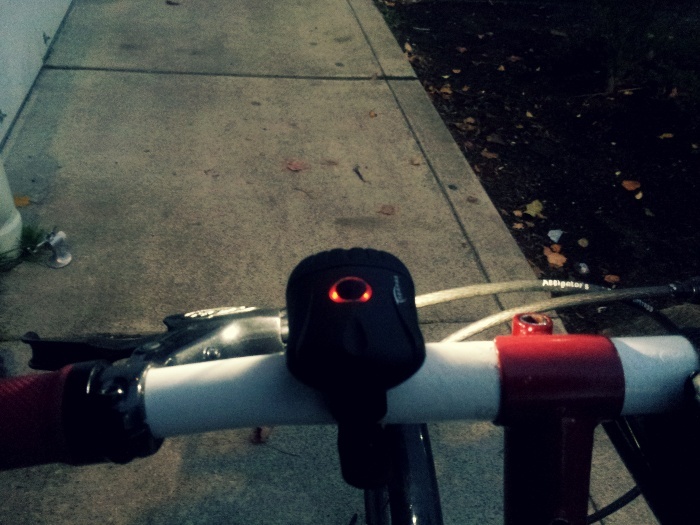 It will double (as most bike lights do) as a flashlight. This one just looks like a regular flashlight when it is off your bike. I think that this is something that Dorcy does well. This light transitions from one function to the other without looking awkward in either. There’s a lot of wins for the Hawkeye so far. Depending on your perspective and the type of biking that you do the pros and cons listed so far can sway your vote either way. Here is where I feel that the unit falls short despite how you intend to use it. The handlebar mount has a notched pull strap and a screw tensioner to make sure that the unit is tight on the handlebar. This is where the overall weight of the design of this unit is a hinderance. Because the unit weighs so much and because you are going to be riding a bicycle (typically not smooth riding), the headlight is going to be exposed to vibrations. To accommodate these facts, Dorcy has to include two systems to make sure that the light stays in place. The nice thing about this design (and most headlight handlebar mount designs) is that you don’t need to remove any existing handlebar hardware to mount the clamp. I’ll be using the headlight for the next couple of weeks and will update this post with my thoughts. Until then, check out more about Dorcy on their website. I took a couple of night rides over the last two weeks to test out the Dorcy headlight and see how it fared against my current headlight. My initial impression when I turned it on was great. I was shining the light against my fence to see how bright it was and at 20 feet, the light was bright and lit up the necessary space in front of my quite well. I was liking it so far! Dorcy lighting up a fence! Serfas lighting up the fence. As you can see from the images above that the Dorcy light is much more focused. I was looking forward to a much better lit path. But, as I got started on my ride, the intensity of the light just didn’t seem as much on the trail. I’m not sure if my senses were dulled from the brightness that was cast on the fence or if the square light was changing my perception. I stopped and took a couple of pictures of the light beam that was cast from both lights as a comparison. As you can see, the Dorcy light puts a significant amount of light down on the path in front of you (albeit in an odd pattern). The Serfas that I’m accustomed to using just didn’t put down as much light as the Dorcy. And when you compare 70 lumens to 220 lumens, you would expect as much. The square pattern was still something to get used to. I wish that I could see a Dorcy headlight without the square pattern to compare it to a more standard pattern. I think that it would be interesting to see the differences and to know why they chose the square pattern. This light, being the beast that it is, will drain it’s batteries quite quickly. Dorcy is stating only 2.5 hours and I bumped up against this. I noticed the light dimming after extended use and will have to change the batteries for my next ride. If you have a set of rechargeables ready, then this won’t be an issue for you. For those of us that don’t have rechargeable batteries, this is going to have you going to Costco and getting the bulk pack to keep your commute well lit. Overall, this is a great light. It’s got a solid build, a great design and lights the path up nicely. It’s going to cost you some batteries, but for running 220 lumens, this shouldn’t come as a big surprise. Headlights are one of the more useful items that can be mounted on your bike and for those of us that ride in the dark, they are invaluable. Until recently most lights have used standard batteries as their power source. This seems to go against one of biking’s deepest rooted principles. Rechargeable batteries are an option, but are not nearly as convenient as being able to charge your headlight via USB. Enter the Serfas USL-5 Raider. At 37 grams light it is small and attractive enough to put on most bikes. For now, it doesn’t come in pink (or any alternate color for that matter). For those into a more colorful look, checkout the Blackburn Flea. The mounting system is clever making this light a breeze to take on and off of the handlebars (or wherever you choose to mount it). It comprises of a hook mounted on a flexible strap with holes in it. This is a welcome design element as this light will need to be removed every few days depending on how you use it. The fact that this light can be charged via a micro USB cable was the main attraction to this light. 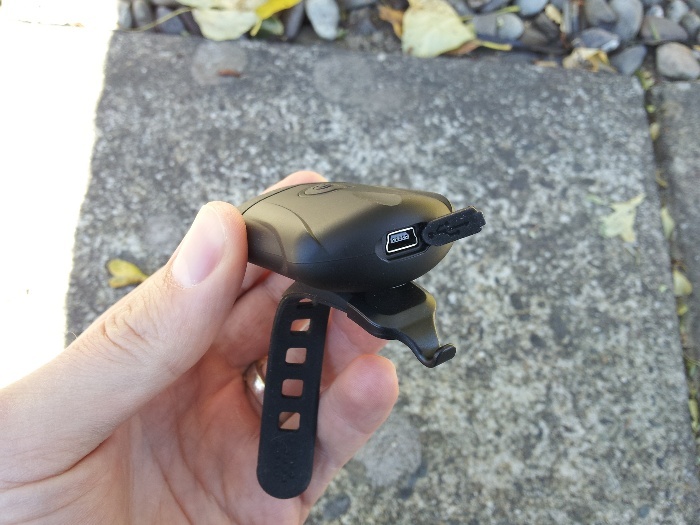 The charging port is conveniently located at the back of the light and can be accessed by grabbing one side of the rear cover and pulling it to the side to reveal the micro USB port. Charging this headlight is easy and can be monitored during the charging process. The ring around the power button on top of the light gives you an indication of what your headlight is doing/needing. When plugged in, flashing blue LED’s indicates that you headlight is happily being charged. A steady blue light means that your light is full and ready to illuminate something. If you are out on a ride and the ring around the power button starts flashing, you need to plug it in the next time you are near a power source. This product is currently being tested. I’ll be using it on a daily basis and will post my findings in a couple of weeks. Check out more at Serfas. After using this headlight for the past couple of weeks, I love its simplicity. It is easy to take on and take off of your handlebars which made it convenient when I had to run into the store. Keep this point in mind with anything that is easily removed from your bicycle! It is better to be safe than to walk out of a store and realize that your headlight is missing. The light lasted 7 days for me on high mode. Translated, this will last you about 5 hours which is a little bit less than the advertised 6 hours. I’m assuming that the difference here is the fact that I stopped counting right when the top LED started flashing red (indicating the batteries needed charging).